The "Execute shell slicer" option of the Configuration Slicing Plugin seems to list only the first shell build step. Would be great if all the shell build steps could be listed. Now in the "Execute shell slicer" option of the Configuration Slicing Plugin I see and can edit only the first shell build step (which does the clean up in the example above), whereas the more important stuff happens in the build step that's not available in "Execute shell slicer". If there's any chance that could be improved you'd make my day. It is explained on the wiki @ https://wiki.jenkins-ci.org/display/JENKINS/Configuration+Slicing+Plugin under the "String slicing multiple Builders" section. Jacob Robertson added a comment - 2012-05-19 12:58 Look for this feature in the most recent version 1.29. 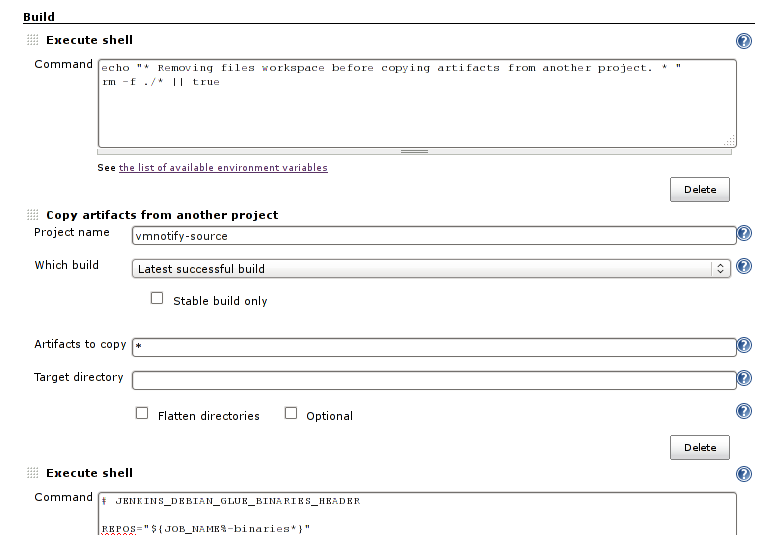 It is explained on the wiki @ https://wiki.jenkins-ci.org/display/JENKINS/Configuration+Slicing+Plugin under the "String slicing multiple Builders" section.